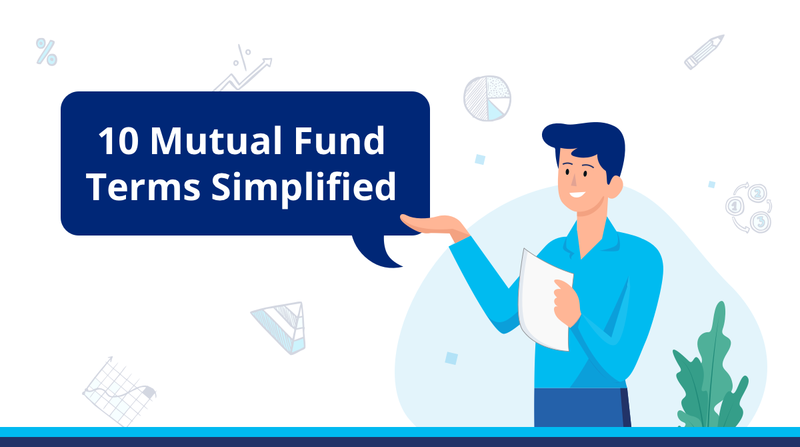 If you have been exploring the mutual funds industry, you must have come across these terms loosely thrown around. Here’s what they actually mean. NAV: The Net Asset Value (NAV) of a mutual fund represents its per share market value which is updated on a daily basis. When you buy a mutual fund unit, you buy it at this ‘price’ and the same goes for selling the units too. Scheme Benchmark: A scheme’s performance is compared against a benchmark or indices. Typical benchmarks being Sensex & Nifty50. The benchmark index chosen is based on the objective of the fund. Annualized Returns: The amount of money the investment has earned for you over a year, are your annualized returns for an investment. AUM: Assets Under Management is the total value of assets or capital owned by an asset management company (AMC). Folio Number: When you invest in a mutual fund scheme, you are allocated a unique number by the AMC. A user can have multiple folio numbers for a specific scheme of the same AMC. Scheme Riskometer: A scheme riskometer indicates how risky that scheme is, from a spectrum of it being low, moderately low, moderate, moderately high or high. Each scheme has its unique riskometer. Exit Load: As the name suggests, it implies the fee that is charged by AMC when a user withdraws before the lock-in period is over. Investment objective & policies, asset allocation pattern, fee & liquidity provisions. The document also contains information about fund management team details, risk factors, load, past performance, benchmark, unit holder information, AMC branches, investor service centers & official points of acceptance. Fund Rating: It is a score assigned by rating agencies to schemes after assessment of securities based on multiple factors such as risk, historical performance & returns of a fund. Lock-in Period: A set period during which an investor is restricted from selling units of a mutual fund. The restriction is imposed by the fund house, in the form of exit loads, or fee that an investor must pay. ELSS funds typically have a 3 year lock-in period, while debt or liquid funds have a much shorter lock-in period.